When casting on a new pair of socks for Mr Awesome I deliberated a while over which cast on to use. For quite a while now I have stuck to my Favourite Sock Cuff any time I have started a new sock project, but recently I have wanted to step away from that comfortable, stretchy place and just give a few others a go. As my favourite sock cuff is basically a knitted down hem I decided to give the tubular cast on a go, because it is, in essence, a teeny tiny hem. I know that the tubular cast on has been heralded by many and is very well regarded, but I didn’t find it had quite the stretch or such a return to neat finish as what my usual sock cuff allowed, so put it to the back of my mind. However, whilst reading up on the different ways to achieve the tubular cast on I also stumbled upon the alternating cast on, and I think this has finally toppled my Favourite Sock Cuff from it’s protected and revered pedestal. This cast on is designed for single rib. As you can see from the small swatch there is not a cast on ‘edge’ as such – the initial row of stitches form alternating knits and purls on the front and back of the fabric and blend seamlessly into the resulting fabric, and it is completely and perfectly reversible. Every knitter has seen this cast on before. It is the foundation for just about every machine knit sweater, cardigan or pair of socks that you might buy at the shops. And boy, is it stretchy. So stretchy, in fact, that whereas with other cast ons you may try to space cast-on stitches apart to allow more yarn, or cast on loosely or over larger needles, it may be required with this cast on that you use a needle size smaller than you require for the ribbing, or at least maintain a snug tension when casting on. In the sample above I used the same needle size for casting on as I did the ribbing, but I kept my stitches close together and snug. Using this cast on is relatively simple, though it might take a little practice to get the rhythm remembered, simply because there are two different stages, that which forms the ‘knit’ stitch and that which forms the purl. 1: To cast on, use a slip knot or backwards twist to form the first stitch on the right needle, leaving a long tail to cast on with. Hold the yarn as if for a long tailed cast on, with the main strand over the left index finger and the yarn tail over the thumb, ends secured in the palm of the hand. 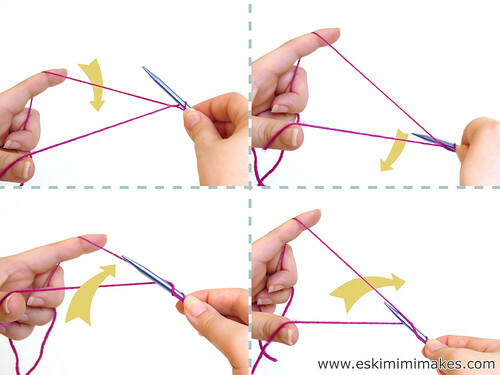 2: Take the needle from front to back, under the thumb strand, coming up between the two strands. 3: Take the needle over the back strand and then under both strands to the front. 4: A ‘knit’ cast on stitch has been created. 5: Bring the needle over both strands. 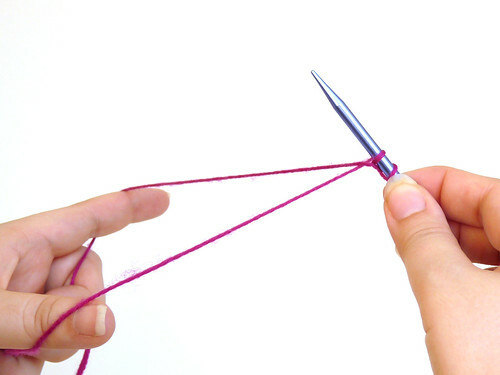 6: Take the needle behind both the thumb and finger strands and up from underneath to the front of the thumb strand. 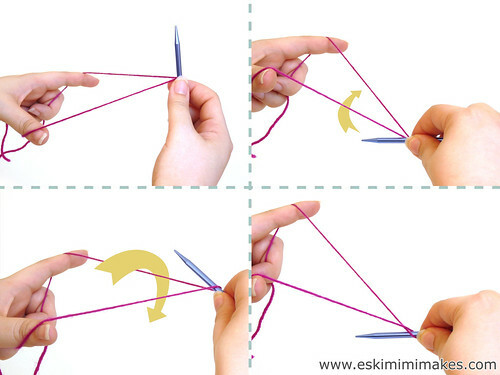 7: Take the needle back over the thumb strand. 8: Bring the needle underneath and behind the index finger strand. 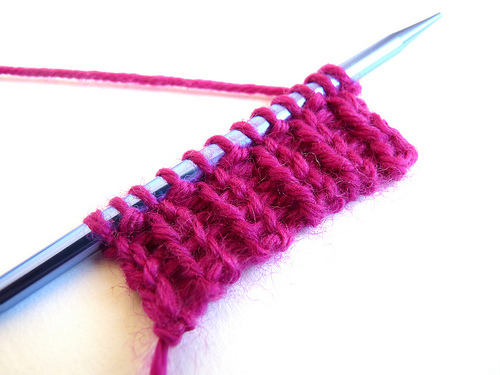 9: A ‘purl’ cast on stitch has been created. Repeat steps 1-8 until number of desired stitches have been cast on. Remember to keep hold of both ends of the yarn when casting on as they will not be anchored if they are released. If working flat, ending on step 4 will mean that the first stitch of the next row will be a purl stitch. If ending on step 9 it will be a knit stitch. This is a fantastic cast on and perfect for socks, gloves and anything else that can make use of single rib. It is handsome and provides a strong, extremely elastic edge. It’s wonderful. This looks excellent – what a lovely neat edge. I need to try this with my next pair of socks. Thankyou for this post! Me again. Spent a good while playing with this yesterday evening, I like it even more. A variation on the two-strand tubular cast-on, and a very good one too! I love this alternating cast on, it really does create a lovely ribbed edge that stretches like mad. I imagine a hat would look really nice using this method too. Oh I used this on an Ysolda hat once. I remember she recommended not using a circular needle because once the stitches get onto the cable it is a bit tricky trying to knit into them. I didn’t have any straights though so I battled on and it worked out OK.
@Fiona – thanks for popping back and letting me know what you thought of the cast on – so glad you agree – i think I am in love with it! I have to bookmark this for my next pair! I’m not understanding which yarn to pick up after each wrapping. Could you let me know? I’m sorry – I don’t quite understand your question. You hold the yarns in the same position throughout the cast on. You shouldn’t be letting go of either end. Hi! I’ve used this for my last four pairs of socks and I love it! Thank you so much for posting this tutorial. I like this better than the tubular cast on I had been using for 1×1 rib, and this alternating cast on is easier to work, too! OMG, this is stretchy! I too was disappointed with other not-so-stretchy tubular cast on methods–some have you work on three rows of stockinet stitches and then pick up purl bumps while other methods variations of alternating slip stitches for four rows, yarn overs, etc. People say tubular cast on is stretchy but I always end up with tight cast on edges. You are right about this one though. I may have to go down a needle size or two because the cast on edge is flexible. Thanks! I *think* this one is called the Italian tubular cast on – if you try searching on youtube there will be videos. I am intrested in trying this- seems too good to be true.